We've all been there. Late to class/midterm because of traffic, oversleeping, or girlfriends troubles (just kidding we're in computer science). You get to class and you're too hungry to focus. Our app allows for you to order food to your classroom (like ubereats for the school). For a small fee another student can pick up your food and deliver it to you. We used firebase to build our databases where we hold order information and account information. We implemented a map so deliverers can know exactly where to go to reach their classroom. We also added extra security that uses a random picture that both parties have access to, in order to confirm purchases (the confirmation uses AR as well). 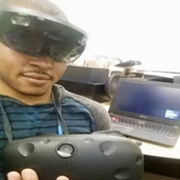 Virtual Reality software developer dedicated to creating engaging and interactive experieces.